The series started all the way back in 2006 with The Blackwell Legacy, which was followed by Blackwell Unbound in 2007, Blackwell Convergence in 2009 and most recently, Blackwell Deception in 2011. Over the years, this point ‘n click adventure series has gathered quite a following – particularly on the aforementioned AGS forums – and reviewers aplenty has sung its praise, but that was then and this is now. Let’s jump to the present and the recently announced Blackwell Epiphany. A dead man’s soul cries out against the force of a ferocious blizzard. He cries for help. He cries for answers. Then he screams as he is torn apart like damp tissue paper. This wasn’t the first time, and it won’t be the last. Chilling! 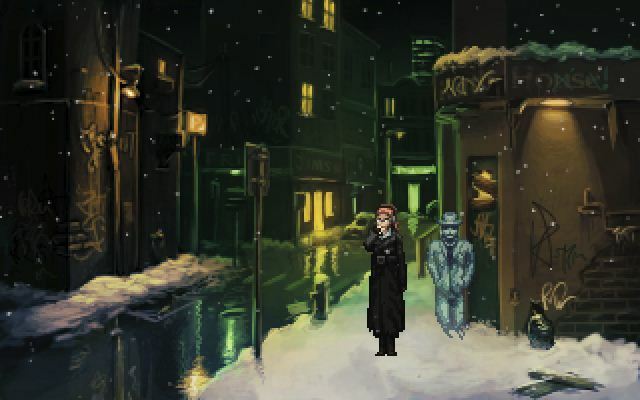 It seems that just like in the four games before it, Blackwell Epiphany will once more find Rosa and Joey working to solve a mystery involving supernatural beings and other phenomenons that logic simply can’t explain. Like the rest of the series, it will be powered by the Adventure Game Studio (AGS) engine and in terms of visual design, they’re going for a very familiar pixel style. Can’t say I’m surprised, and certainly not displeased, since Ben Chandler (aka. ben304) will be in charge of that.